Social media management software for growing businesses. Manage multiple social networks, schedule unlimited posts, monitor keywords, and collaborate with your team — all from a single dashboard. 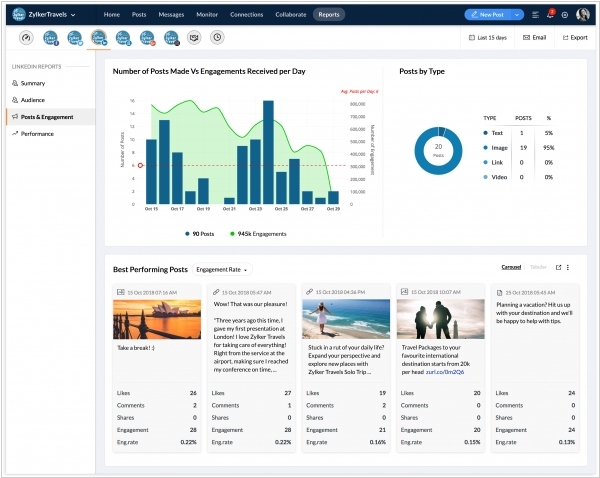 Social media management software Zoho Social has added revamped Reports tab that includes new data sets and graphs in an all-new interface, built from the ground up. 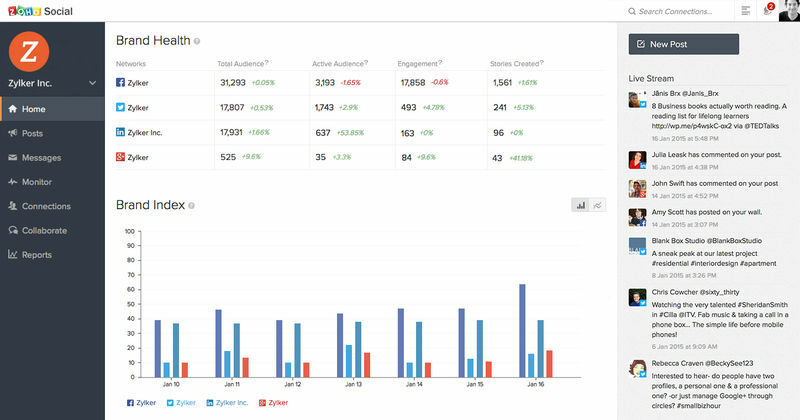 The new Reports tab gives you a summary of your stats such as Audience demographics, Posts and Engagement analytics, Performance, and Reach & Impression, while also letting you dive deep into each one of these areas. It will also include custom dashboards for our Professional and Agency edition customers. The new Google My Business integration can help businesses schedule and publish posts to their GMB accounts, view and reply to the reviews they’ve received on their listings, and manage their presence across multiple locations using their GMB account on Zoho Social. Every social interaction is an opportunity for lead generation. 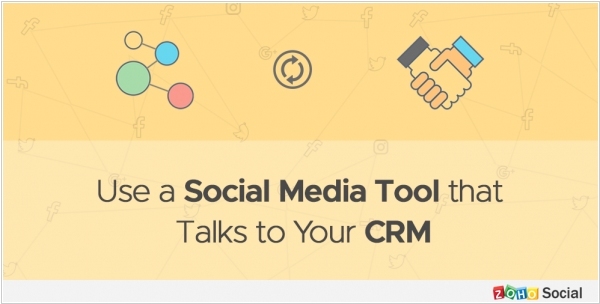 That's why social media management tool Zoho Social added integration with Zoho's CRM. It allows to automatically create new leads from different social networks, such as: Twitter timeline, likes, keywords, or followers; Facebook likes, posts, or messages; Google+ keywords... and more. So, you can track revenue from your social media marketing efforts. 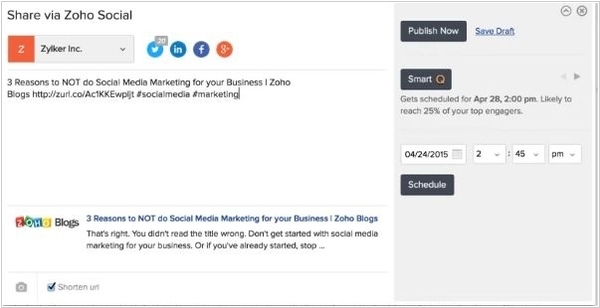 Another new feature in Zoho Social is Instagram scheduling and posting. Many brands use repost for Instagram in interesting ways to build their profile and drive engagement. So the Repost for Instagram on Zoho Social will help to automate this process. Zoho SocialShare - is a new browser plugin for social media marketing service Zoho Social, designed to help brands easily curate and share content. It allows to share content without switching browser tabs (when you come across an interesting article that is relevant for your audience, all you have to do is click on the Zoho SocialShare icon in your browser), save content as draft idea or discuss later, schedule sharing, pick your favorite lines to share. All the content you share from it will show up in your Zoho Social dashboard so you can track how your audience engages with different articles and figure out what’s working best for them. Zoho SocialShare is available on Firefox and Chrome web browsers and comes for free with all Zoho Social plans. 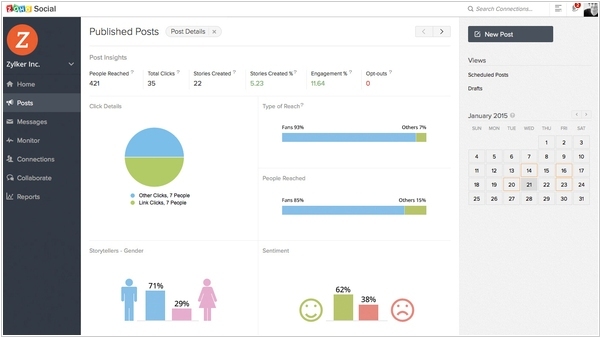 Zoho has launched a new tool - social media marketing product called Zoho Social. Zoho Social has a real-time monitoring dashboard that allows to listen to what’s being said about your brand or a keyword you wish to track; and respond when you need to. There are instant notifications to make sure you do not miss any relevant conversation and can react faster. It also helps with pre-publishing insights based on the engagement in previous posts and activity of your audience, shows the percentage of your audience that’s likely to see your post now, suggests next best time to post and lets you schedule a post to go out. And Reports section allows to take a glance at social-network-specific stats or dive deep into the analytics to understand more about your audience and how they engage with your content. That’s not all; you can also create customized reports that focus on the numbers that matter most to your business.